A while back I received a Deutsche Post delivery note informing me I had a package down at the post office waiting to be collected. “Funny,” I thought, “I haven’t ordered anything online recently…and it’s not my birthday.” Bizarrely, the package appeared to have been sent by Deutsche Post itself. My attempts to retrieve this mystery gift evolved into a trek through the bureaucratic intransigence of ‘Servicewüste Deutschland’. 1. Go to post office and present delivery note and Australian driver’s licence to tight-lipped female clerk, who tells you to come back with your passport and gets visibly annoyed at you for not understanding how the system works. 2. Return to post office the following day and present delivery note and Australian passport. Male clerk tells you the system only accepts German ID cards. Explain that you are not German and hence do not have a German ID card. Clerk insists he cannot give you the package. 3. Ring the Deutsche Post number listed on the delivery note. A call centre agent informs you that, as a non-German, you can of course pick up the package using your passport. Mr Call Centre asks to speak to Mr Clerk, urging you to cut the queue and put him on the line. 4. Cut queue to a palpable chorus of murmured indignation and resentful looks. Explain situation to Mr Clerk, who then refuses to take your mobile phone and talk to Mr Call Centre. 5. 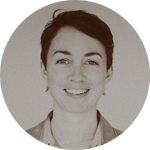 Act as middle man in hopeless negotiations between two Deutsche Post employees. 6. Hang up, queue up again and make one final appeal. 7. Leave post office empty-handed. What on earth was in this package? Was Snowden trying to send me highly sensitive material? Would I have to renounce my Australian citizenship and become German in order to collect my mail? After this failed attempt, the package was returned to the sender. Another call to Deutsche Post revealed that the package was “probably just advertising”. Advertising that requires ID verification to pick up? This was a whole new breed of German red tape I had not yet encountered. The call centre also confirmed that such packages can only be received by non-German citizens if they are home to collect the package when it is delivered. If you’re not home and it ends up back at the post office, well, tough luck, Ausländer! PART III: WELL I’LL BE SCAMMED! When yet another postal delivery note was pushed through my letterbox, I asked my German friend Stefan to accompany me to the post office in a last ditch effort to solve the mystery of the secret package of extreme bamboozlement. (Which, I believe, is also the name of the final instalment of the Harry Potter series.) I carefully filled out the Bevollmächtigung, authorising him to pick up the package on my behalf, then lingered outside on the street lest Mr Clerk recognise me and stymie our plan. When Stefan emerged triumphant, we tore open the packaging to reveal: a DHL gold card. What, you may ask, is a DHL gold card? Good question. I didn’t know, because I certainly hadn’t ordered one. Gemeinfrei It turns out that a DHL gold card allows you to pick up packages from a DHL pack station. When I googled it, the top results included articles about a DHL gold card scam currently doing the rounds. Great. How it works: the scammers get hold of your address details and order a DHL gold card for you. 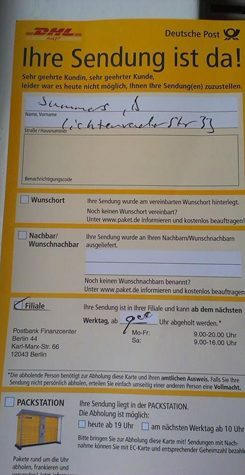 After you pick it up (assuming you are a German citizen able to take receipt of ID-verified post in this country), a phoney DHL employee turns up on your doorstep to collect the card, claiming it was sent by mistake. They can then somehow use this card to order things online and the scam victim gets sent the bills. Luckily, no such DHL bloke has yet knocked on my door. And so the saga came to an end. The police were notified, the DHL gold card destroyed. The moral of the story? If you’re going to organise a postal scam in Germany, don’t include ID verification if you plan to fleece foreigners.